Modern digital timers are accurate and all, but lack the timeless style of an old-fashioned hourglass sand timer. 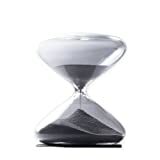 In place of the traditional sand used in most hourglasses, this cool new Ikepod Steel Nanoball Timer drops millions of ultra tiny 0.3 mm steel nanoballs through the tiny central opening in the hand-blown borosilicate glass hourglass. The steel nanoballs are coated in either silver, gold, or copper colors and the hourglass itself comes in either a 5.5 inch 25 minute version or a 4 inch 3 minute version. It's minimalist, modern in a retro way, and uniquely decorative in your kitchen, desktop, or anywhere you want to count down the time in style.